Less than a month had passed from the September 11, 2001, terrorist attacks and Lauren Baer, then a student at Harvard University, was calling the American response to the attacks that killed nearly 3,000 a "moment of hypocrisy," attacking its "shameful history," and hoping for a "more humble and humane" America to emerge. Baer, who went on to work in the Obama administration as a senior adviser in the State Department under both Hillary Clinton and John Kerry and is currently running for Congress, wrote a column every two weeks for the Harvard Crimson. Her October 10, 2001, column, "From Hypocrisy to Humanity," was highly critical of the United States, criticizing some of those who responded to the attacks. "Some people speak of wanting an America to emerge from these events that is stronger and more proud," Baer wrote. "I wish to see an America emerge that is humbler and more humane." She also wrote that America had a "shameful history" of standing up for its values. "At the same time that America calls on the world to ardently preserve our sacred values, it must live up to a shameful history of having so rarely stood up for those values itself," Baer wrote. Baer was critical of the framing of the attack as an "attack on the world," writing that "everyday the world is plagued by more mundane battles" that are "just as much an affront to justice as were the events on Sept. 11," bringing up specifically "genocide in Rwanda," "civil strive in the Congo," and "ethnic cleansing in Bosnia." "By the rhetoric of an attack on American values anywhere being an attack on security everywhere, they should have warranted a meaningful U.S. response," she wrote. "But the U.S. response to these atrocities was meager, if it existed at all." Baer is now running as a Democrat in Florida's 18th district—an email sent by her campaign shows her recollection of how she reacted to the events has changed. She wrote that she didn't know then "how we'd be called to defend American values." "I was on the cusp of adulthood, and our country was on the cusp of changes that would define my generation," she wrote in the email. "We didn't know yet then about how we'd be called to defend American values at home and abroad." 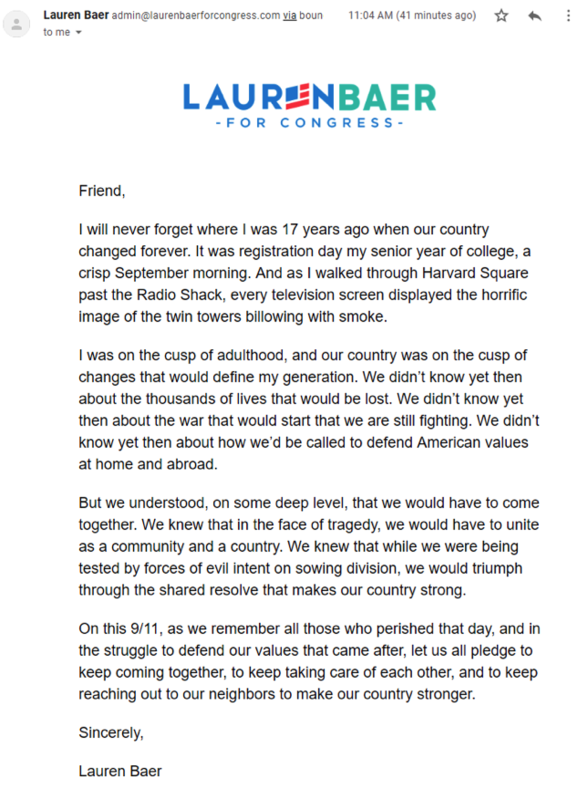 "On this 9/11, as we remember all those who perished that day, and in the struggle to defend our values that came after, let us all pledge to keep coming together, to keep taking care of each other, and to keep reaching out to our neighbors to make our country stronger," she wrote. Baer's opponent is incumbent representative Brian Mast (R., Fla.), who was a reserve in the U.S. Army when the attacks happened and went on active duty in the aftermath, eventually losing both his legs to an improvised explosive device during a 2010 mission in Afghanistan. 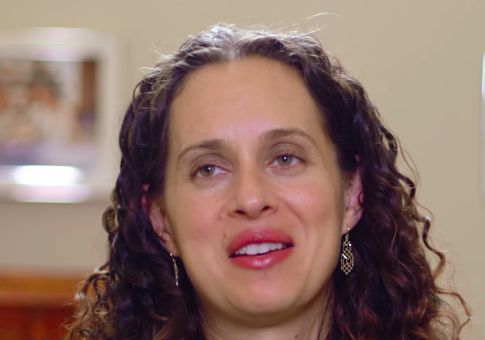 Baer did not respond to an inquiry into the Harvard Crimson piece and whether she stands by the points she made in it. This entry was posted in Politics and tagged Florida. Bookmark the permalink.